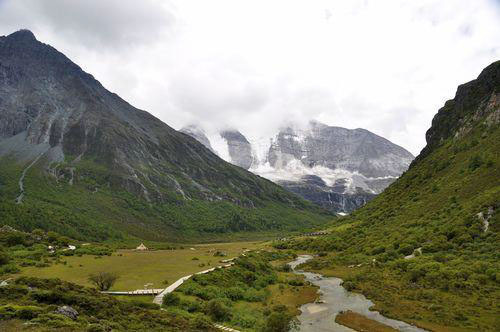 The Yading Nature Reserve is found in western Sichuan’s Ganzi Tibet Autonomous Prefecture དཀར་མཛེས་བོད་རིགས་རང་སོང་ཁུལ་ in the traditional Tibetan region of Kham ཁམས་. Ganzi, known in Tibetan as Garnze དཀར་མཛེས་, is divided into 18 counties covering an area of 151,000 square kilometers (58,300 square miles). 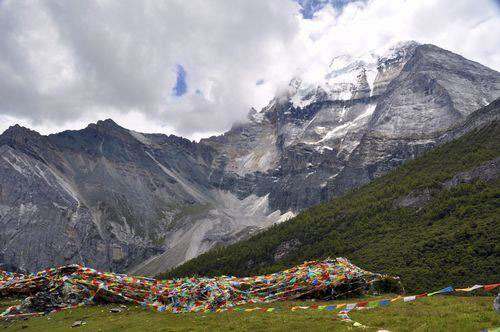 Yading is located in southern Daocheng county, which is known as Dapba འདབ་པ་ in Tibetan. The Yading Nature Reserve covers an area of 1344 square kilometers (520 square miles) and has an average elevation of well over 4000 meters. 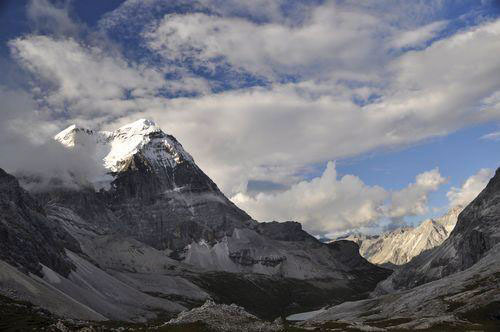 Inside the Yading Nature Reserve are the 3 holy mountains of Chenresig, rising to 6032 meters, Chana Dorje and Jampelyang, which both rise to 5958 meters. These 3 snow-capped peaks sit in a triangle formation with forested valleys, clear rivers, glacier-fed lakes and abundant wildlife between them. The Tibetan name for Yading is “Nyiden” ཉིན་རྟེན་, which means “facing the sun”. The local Tibetan name for the area around the 3 holy mountains is “Rigsum Gonpo”. 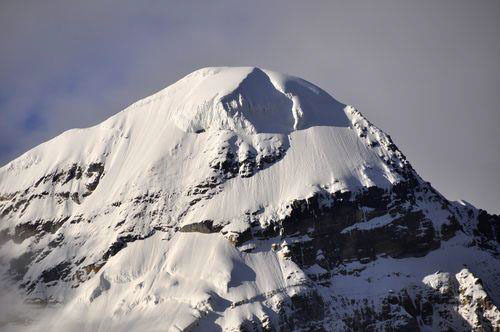 In Tibetan, the names of the mountains mean “Wisdom” (Jampelyang), “Power” (Chana Dorje) and “Compassion” (Chenresig). This region was designated as a nature reserve in the late 1990’s. The first westerner to see the area of Yading was the famous American botanist and explorer Dr. Joseph Rock. Dr. Rock explored the southeastern portion of the Tibetan Plateau (modern day western Sichuan and northwest Yunnan provinces) in detail for over 20 years beginning in the mid-1920’s. In 1928, he arrived in Yading and photographed the entire region. In the July 1931 issue of National Geographic, more than 60 pages are dedicated to the writings and photographs of Dr. Rocks travels in this area. This issue of National Geographic gave the world its first pictures of the incredible beauty of the Yading area. Many regions of the Himalaya’s are referred to as “Shangri La”, the fictional paradise written about by James Hilton in his famous novel “Lost Horizon”, which was published in 1933. In 2001, the Tibetan county of Zhongdian (Gyelthang in Tibetan) in northwest Yunnan province was officially renamed “Shangri La” in an attempt to market more tourism to the area. Other regions in Nepal, India and Bhutan market themselves as being the “real Shangri La”. Most likely, James Hilton based his fictional place of Shangri La after the pictures that Joseph Rock published in the July 1931 issue of National Geographic. More recently, the small town of Riwa, located 35kms north of the entrance to the Yading Nature Reserve, also officially changed its name to “Shangri La”. Of all the places that call themselves “Shangri La”, the Yading Nature Reserve probably best represents what James Hilton was thinking about when he wrote “Lost Horizon”. Though the outside world didn’t learn about Yading until 1931, local Tibetans have known about Yading for more than 800 years. Tibetans from the region have long considered the 3 peaks of Chenresig, Jampelyang and Chana Dorje to be the “abode of the gods”. Pilgrimage circuits go around the entire region as well as around each individual mountain. Local Tibetans try and complete a circuit around the highest mountain in the reserve, Chenresig, at least once a year. Due to its remoteness, the Yading Nature Reserve is still relatively unknown to foreign travelers. It is not listed in any of the major guidebooks for Tibet or China and getting accurate travel information for the area is difficult. Yading is becoming more popular among Chinese tourists, but even during the high season the tourists numbers are relatively low, especially compared to other popular areas on the Tibetan Plateau such as Lhasa, Jiuzhai Gou and Shangri La. There is talk about an airport being built near Yading, which I am sure will drastically change this quiet, tranquil area. Yading Nature Reserve is not the easiest place to reach. With no airport and no railway, the only way to get there is by public bus or private vehicle. From Chengdu, there is a daily bus during the high season (June through early October) that goes to Yading. The distance is 865 kilometers (540 miles) and takes between 20 and 25 hours to complete. This is a long and difficult bus journey and is not recommended unless you are extremely short on time. The most popular way to reach Yading is to go from Chengdu to Kangding (Dartsendo in Tibetan) and then work your way to Yading from Kangding. From Chengdu, there are multiple buses per day to Kangding, known in Tibetan as Dartsendo. 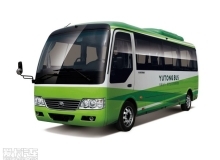 The bus costs 120 RMB and takes between 8 and 10 hours. Buses from Chengdu leave from the Xin Nan Men bus station or from in front of the Kangding Hotel in the Wu Hou Ci district. From Chengdu to Kangding is 330 kilometers. From Shangri La in northwest Yunnan province, there is also a daily bus to Daocheng leaving from the main long distance bus station. This bus ticket costs around 108 RMB and takes about 10 hours. The distance from Shangri La to Daocheng is 310 kilometers (193 miles). From Daocheng (elevation 3700 meters), there currently is no public bus to the Yading Nature Reserve, however there are plans for a public bus to begin in 2012 or 2013. The only way to get there now is by shared taxi. These shared taxi’s leave from in front of the bus station on the main road in Daocheng. The cost is 50 RMB per person. These shared taxi’s leave when they are full. The drive is 3 hours and covers a distance of 110 kilometers. In Daocheng, the owners of Here Cafe and Guesthouse are very friendly and helpful. They know the Yading area well and can answer any questions regarding the region. They also have a great guesthouse that serves good food. Entrance tickets to Yading Nature Reserve are bought at the small town of Riwa, which recently changed its name to Shangri La. Riwa is located 75 kilometers south of Daocheng and 35 kilometers before Yading. The taxi drivers know that people need to purchase their entrance tickets in Riwa so you shouldn’t have to tell the driver. The entrance tickets cost 150 RMB per person. There is no reason to stay in Riwa, but there are several decent hotels and guesthouses to stay at if you need to stay there. Just south of Riwa, there is a checkpoint where your entrance tickets will be checked. This checkpoint marks the official entrance to the nature reserve. From Riwa, it is another 35 kilometers to the small village of Yading. Yading Village has a few simple guesthouses to stay at as well as a few Chinese and Tibetan restaurants. From Yading Village it is another 4 kilometers (2 1/2 miles) to Long Long Ba, which serves as the entrance to the Yading Nature Reserve. Your driver from Daocheng should drop you off in Long Long Ba, but ask him to make sure. Long Long Ba is a small village with just 1 or 2 accommodation choices. The Yading Nature Reserve is full of stunning beauty and is an excellent place to do some trekking. If you don’t have time to trek or have no interest in trekking, Yading is still very much worth going to. The main route that travelers take in Yading is the ancient pilgrimage route around Mt. Chenresig. The village of Long Long Ba, the actual starting point of the trek, lies at an elevation of 3770 meters. If you don’t wish to hike, you can hire a horse at Long Long Ba to take you to Chonggu Monastery, known as Tsongu Gompa in Tibetan. The distance from Long Long Ba to Chonggu Monastery is around 3 kilometers (2 miles) and takes about an hour on horseback. To hire a horse and an animal tender is 30 RMB one way or 40 RMB round trip. Chong Gu Monastery sits at 4000 meters. This small monastery is nearly 800 years old and sits at the base of Mt. Chenresig’s north face. Mt. 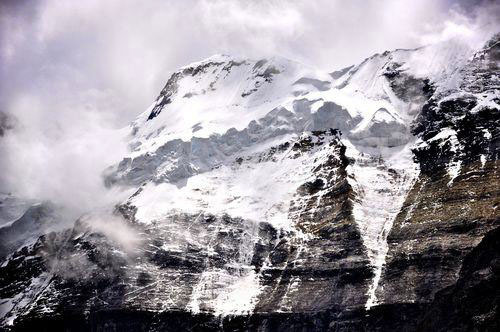 Chenresig, known in Chinese as Xian Nai Ri, is the highest mountain in the reserve rising to 6032 meters. The views of Chenresig from Chong Gu Monastery on a clear day are superb. 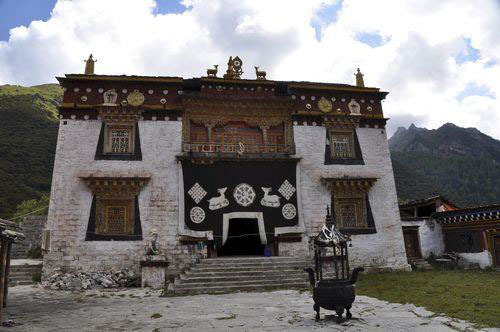 Some older information on the internet states that Chong Gu Monastery has a guesthouse. However, after asking some of the monks at the monastery, they said the guesthouse no longer exists. The nearest accommodation is at the trailhead at Long Long Ba. From Chong Gu Monastery, the next main site is the Luorong Grasslands. About 100 meters past Chong Gu Monastery, there is a wood building on the left side where you can purchase tickets for an electric cart that can take you to Luorong. Tickets cost 50 RMB one way or 80 RMB roundtrip. The route between Chong Gu and Luorong is on a paved road that goes through a forested area following Mt. Chenresig’s east face before arriving at the wide open Luorong Grasslands. The distance between Chong Gu Monastery and Luorong Grasslands is about 6 kilometers (4 miles) and takes about 20 minutes in the electric cart. The Luorong Grasslands lie at an elevation of 4180 meters and offer an amazing view of all 3 holy mountains. On the right side is Mt. Chenresig’s southeastern face. On the left side is Mt. Chana Dorje’s (known as Xia Nuo Duo Ji in Chinese) northeastern face while Mt. Jampelyang’s (Yang Mai Yong in Chinese) north face dominates the front view from the grasslands. Luorong is one of the most scenic spots in Yading. In addition to the paved road that leads to Luorong, there are also some wooden walkways and bridges that are built on the grasslands to the right of the road. Walking directly on the grasslands is not allowed. Towards the middle of the Luorong Grasslands there are some permanent huts where local Tibetan herders live during the late spring and summer months. Older information on the internet suggests that you can either camp at Luorong or stay in one of the nomads huts, however the leader of the Luorong Grasslands informed me that neither was possible any longer. Camping at Luorong is strictly forbidden and the local Tibetans are not allowed to host guests. Nearly all Chinese tourists will take the electric cart to Luorong. Very few, if any, will hike in. After Luorong, the pilgrimage path around Mt. Chenresig gets more difficult and rough. The Tibetan nomads who live at Luorong rent horses and an animal tender to take people to Milk Lake, the next main attraction along the pilgrimage route of Mt. Chenresig. The distance from Luorong to Milk Lake, known as Niu Nai Hai in Chinese and O Tso in Tibetan, is about 5 kilometers (3 miles) and takes about 1 1/2 to 2 hours on horseback each way. Milk Lake sits at an elevation of 4480 meters. The cost of renting a horse from Luorong to Milk Lake is around 200 RMB to 300 RMB per person for the roundtrip. Milk Lake is a stunning glacier fed lake on the south end of Mt. Chenresig. Above Milk Lake is another lake named 5 Color Lake, known as Wu Se Hai in Chinese and Tso Nga Tso in Tibetan. This lake sits at 4530 meters and takes about 20 minutes to reach from Milk Lake. The hired horses usually do not do the climb up to 5 Color Lake so you will probably have to hike this short portion. Sitting right at the base of the south face of Chenresig, 5 Color Lake is the most beautiful lake around the pilgrimage circuit and should be visited. 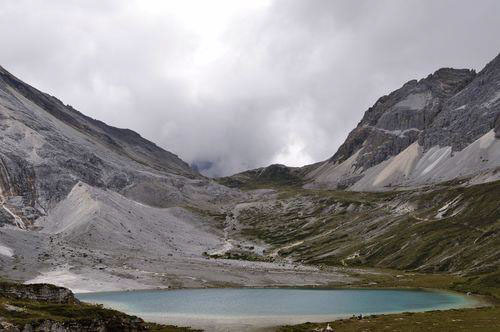 The local Tibetans told me that camping at Milk Lake and 5 Color Lake is not allowed. The closest place to camp would be below the high pass that is about 215 vertical meters above Milk Lake. Milk Lake is as far as you can go without having to trek. Past Milk Lake there are no more horses to be rented. Those not trekking would have to turn around and take their horse back to Luorong Grasslands and then take the electric cart back to Chong Gu Monastery before going back to the trailhead at Long Long Ba. 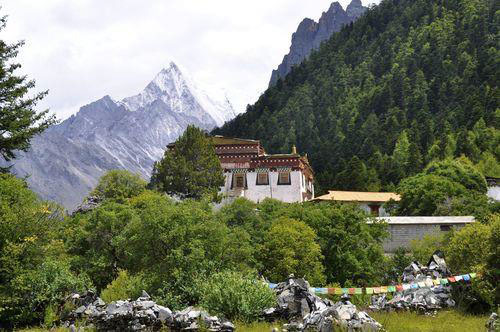 The most popular pilgrimage circuit (kora) in Yading is around the highest mountain, Chenresig. It is possible to do this trek in one long 12 to 14 hour day but, taking 2 days to complete the kora is a better option as it gives you more time to really enjoy the area. Trekkers will need to arrive at Yading with tents, sleeping bags, food and water. Kangding is the best place in the region to purchase trekking gear and food. The town of Daocheng has some small grocery stores, but selections are limited. There are rivers along most of the trek so bringing a water purifier or boiling water is an option. Since nearly all of this trek is above 4000 meters, cold weather clothing is required, even in the summer. The best time to do this trek is from late-April to early June and then from early September to mid-October. The summer months from early June to early September are possible, but rain and clouds severely limit visibility. It is rare to see the summits of the 3 mountains during those months. The winter months from early November through early April bring extreme cold temperatures and heavy snow, so trekking then is not recommended. A guide is not required for the 2 day trek around Chenresig, though if you want one, a guide can be found at the trailhead at Long Long Ba. They charge around 200 RMB per day. If you plan on doing a longer hike in the region, such as around all 3 mountains or to Lugu Lake, it is highly recommended that you take a guide with you. This trek is not recommended for those who have had problems with elevation in the past. The highest point along the trek is 4700 meters and there are no medical facilities in the area. Long Long Ba is the start of the trail around Mt. Chenresig. The elevation here is 3770 meters. The entrance is easy to find as there are dozens of Tibetans offering to rent their horses to those who want to ride to Chong Gu Monastery. The path to Chong Gu Monastery is dirt, but is wide and easy to navigate. It goes through a forested area with a river flowing on the right hand side. There are several high stacks of carved prayer stones along the way. From Long Long Ba to Chong Gu Monastery takes between 45 minutes and 1 hour to hike. The distance is around 3 to 3 1/2 kilometers (2 miles). The elevation gain is around 230 meters. Chong Gu Monastery lies along the north face of Mt. Chenresig at an elevation of 4000 meters. A clear, glacier-fed river flows through an evergreen forest making this spot one of the most scenic along the trek. The views of Chenresig’s north face from here are spectacular. 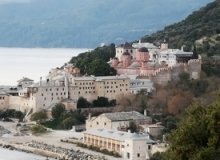 The monastery lies off of the main path on the right side. The trail to the monastery is easy to find. The monastery lies less than 5 minutes off of the main path. On the left side, there are more than a dozen toilets to use. There is also a nice sheltered area with lots of benches to rest on. Using a water purifier (or boiling), you can refill your water bottles from the river that flows below the monastery. The monastery is quite small and has just a handful of monks. 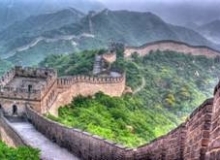 When I was there, no entrance fee was charged, though some places on the internet say that a 10 RMB ticket is required. 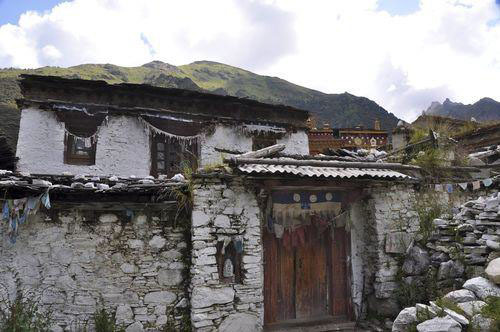 There usedto be a guesthouse next to the monastery, but now there are no accommodations or restaurant. Camping at Chong Gu Monastery is not permitted. From Chong Gu Monastery to Luorong Monastery the path is a paved road. This is the only section of the trek that goes along a paved road. This is not a public road, but a private road where electric carts take Chinese tourists between the two places. Chinese tourists rarely hike and prefer to take the electric cart, which takes about 20 minutes. The road goes through a beautiful forested region following the eastern face of Mt. Chenresig. The road gains a total elevation of 180 meters before arriving at Luorong. The distance is about 6 kilometers (3.75 miles) and takes 1 1/2 to 2 hours to complete. The Luorong Grasslands, elevation 4180 meters, offer an amazing view of all 3 mountains. Mt. Chana Dorje, rising to 5958 meters, will be on your left side, the southeast face of Chenresig will be on your right side and Mt. 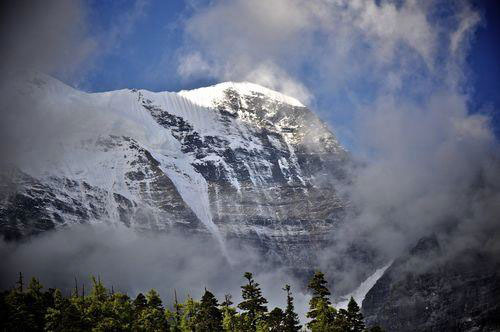 Jampelyang’s north face, also 5958 meters, will be in front of you. Dr. Joseph Rock published a fantastic photo of Mt. Jampelyang in the July 1931 issue of National Geographic. He took the photo from the Luorong Grasslands. The glaciers of Mt. Jampelyang are especially beautiful. As you get closer to Luorong, a wooden walkway goes from the road to the grasslands off on the right side. Both the road and the wooden walkway lead to the same place. Walking directly on the grasslands is not allowed. The Luorong Grasslands are quite large and are a brilliant green color during the mid-summer. There are a high bundle of Tibetan prayer flags in the middle of the grasslands. There are wood benches around these prayer flags where you can take a rest. On the far end of the grasslands are 8 to 10 small huts where local Tibetans live during the spring and summer months. These Tibetans rent horses to Chinese tourists who wish to go to Milk Lake. Camping at the Luorong Grasslands is not permitted and the Tibetans are not allowed to host guests. From Luorong, you will follow the wooden walkways toward the group of huts occupied by local Tibetans. Past these huts, you will go towards the left where the path returns to dirt. You will follow this dirt path along the rest of the grasslands that lie in front of Mt. 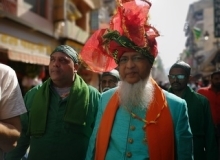 Jampelyang. Leaving the grasslands, the path gently turns around the southeast part of Mt. Chenresig. Keep in mind that you are following the route around Mt. Chenresig and not Mt. Jampelyang. Always keep Chenresig on your right hand side. The path goes up a steep pass that is covered in Tibetan prayer flags. As you reach the top of the pass, the north face of Mt. Jampelyang goes out of view. The path is well marked and you will probably see Chinese tourists on horseback. If you ever have any questions, ask any of the friendly Tibetans you see along the way. Local Tibetans say that camping along the lake shore is not allowed and that you need to descend down below the First Col to camp. After the pass, there is a slight descent and Milk Lake can be seen in the distance. The path remains well marked. The route from Luorong Grasslands to Milk Lake gains about 300 meters in elevation and covers a distance of 4 1/2 to 5 kilometers (3 miles). It takes between 2 1/2 to 3 hours to trek this stage. 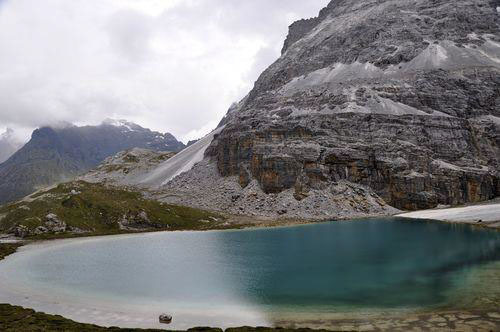 Milk Lake, elevation 4480 meters, is a stunning glacier-fed lake that sits at between Mt. Chenresig and Mt. Jampelyang. This lake is considered holy to the Tibetan people so swimming in the lake is not allowed. Milk Lake, known as Niu Nai Hai in Chinese and O Tso in Tibetan, is very picturesque. The lake is crystal clear and the reflection of Mt. Jampelyang mirrors off the lakes surface. A short 20 minute hike above Milk Lake is 5 Color Lake, which sits at 4530 meters in elevation. This lake sits right at the base of the south face of Mt. Chenresig. The trail leading up to 5 Color Lake is well defined and easy to find. There are piles of prayer stones around the lake that are draped in prayer flags. Five Color Lake is the most beautiful of all the lakes around Chenresig. From Milk Lake, the trail continues north of the lake (right side) and leads up to a col (pass) between 2 mountains. From the shores of Milk Lake, you can clearly see the route that the path follows. From the lake the ascent looks easy, but the top of the col gains about 220 meters. By this point of the trek, most people are feeling quite tired which makes climbing this portion difficult. The trail is a little rocky in spots, but overall is not bad. 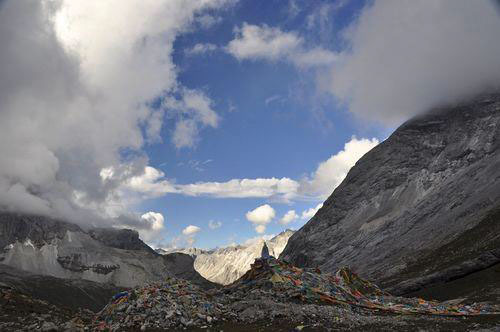 At the top of the pass there are piles of prayer stones and a large amount of prayer flags. The top offers an amazing view of the southwest face of Mt. Chenresig as well as a great view of Mt. Jampelyang. The elevation of the pass is 4700 meters, roughly 220 to 250 meters above Milk Lake. The distance from Milk Lake to the top of the col is 1 1/2 kilometers (1 mile) and takes 45 minutes to an hour to climb. From the top of the pass where the prayer flags are, continue going straight for a short distance. Around 150 or 200 meters past the prayer flags, you will reach a fork in the path. Near this fork, there is a prayer wheel on a wooden pole. At the fork in the road, it is IMPORTANT to turn right (north) and keep Chenresig on your right side. If you continue going straight, you will go off of the the correct path and could become lost. From the turn, you will hike towards the north. Another small group of prayer flags will appear after about 400 meters. These prayer flags stand on top of another pass. From this pass you can see the valley below. The descent from the First Col is quite easy. The trail is rocky in places, but overall is not difficult. After a short while, you will see another alpine lake on your left side. The path continues below Mt. Chenresig on the right side of the lake. 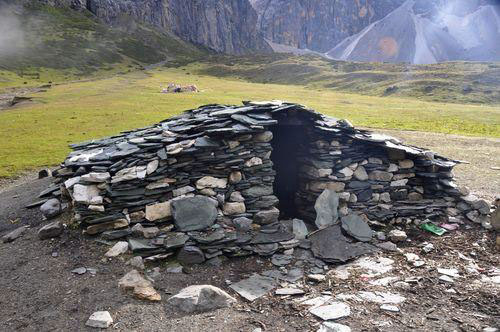 After 45 minutes to 1 hour, you will come to an abandoned rock hut, nicknamed the “First Hut”. This First Hut is on a flat grassland area that is perfect for setting up camp for the night. I recommend camping here for the night as after the First Hut the trail begins to ascend again to another high pass.There is a nearby stream where you can refill your water supply. From the top of the First Col to the First Hut is about 2 kilometers (1 1/4 miles). The elevation of the grassland area where the First Hut is located is 4480 meters. From the first stone hut, you will continue descending the well marked path that lies about 30 meters to the right of the hut. Between the first stone hut and the group of stone huts, the trail gently ascends and descends, but overall drops in elevation around 150 meters. This stage of the trail is quite easy and goes by quickly. Before reaching the group of stone huts, there is a good-sized river that flows across the train (very easy to cross without getting wet) where you can replenish your water supply. There is little or no water during Stages 7 and 8, so make sure you leave here with plenty of water. As a rule of thumb, it is wise to restock your water supply every time you come across a clean river. I personally use a SteriPEN and find that it works excellent with the rivers on the Tibetan Plateau. From this river, which is marked in prayer flags and piles of stones, it is just a short hike to the group of stone huts. The “several huts” I am referring to is a group of 6 or 7 abandoned stone huts that are similar to the single hut mentioned in Stage 5. They are not on a grassland area, but are on a narrow ledge along the side of the mountain. For those hiking to the Kasi Hell Gulley (having a guide for that trek is highly recommended), there is an entrance to that trail from the group of stone huts. The elevation of the group of stone huts is approximately 4340 meters. It takes between 40 minutes and 1 hour to reach the huts from the single hut mentioned in Stage 5. From the group of several huts, the climb up to the Second Col (Pass) is quite difficult and demanding. It is the most difficult stage of the trek in my opinion. The trail remains well defined and easy to see, but almost immediately begins to ascend from the group of huts. About 3/4 of a kilometer past the huts, the trail turns to the right. There is only 1 trail here so you can’t miss this turn. For those unfamiliar with the trail, you might think that this incline is the Second Col (Pass). It isn’t! Once you reach the turn in the trail, you will see that the Second Col is still far in the distance (over 2 kilometers away) and that you are still nearly 250 meters below the col. The trail through this section is quite rocky, but isn’t difficult to navigate. This portion of the trail goes along Mt. Chenresig’s northwest face. Thousands of Tibetan prayer flags mark the top of the Second Col. The wind is normally quite strong and cold here. The top of the Second Col is around 4665 meters. It takes between 2 and 2 1/2 hours to trek the 3 kilometers (2 miles) from the group of huts to the Second Col.
After crossing the Second Col at 4665 meters, it is all downhill the rest of the way. The trail is clearly visible and follows along Mt. Chenresig’s impressive north face. After hiking for about 45 minutes to 1 hour, you will come across a grassland area that is filled with Tibetan prayer flags. There are some more stone huts here and probably some grazing yaks. This point offers one of the best views of Mt. Chenresig as you are now directly below the north face of the mountain. The grasslands where these prayer flags are sit at an elevation of 4400 meters. The distance from the Second Col to these prayer flags is about 1 3/4 kilometers (1 mile). From the prayer flags, the trail continues along the north face of Mt. Chenresig. The trail then goes through a forest of huge evergreen trees. After 30 to 45 minutes, you will reach Pearl Lake, known as Zhen Zhu Hai in Chinese. From the lakeshore, there is a great view of the north side of Mt. Chenresig. The elevation of Pearl Lake is 4140 meters. The distance from the prayer flags to Pearl Lake is 1 1/2 kilometers (1 mile). The final stage of the trek takes you from Pearl Lake, elevation 4140 meters, to Chong Gu Monastery and then back to the park entrance at Long Long Ba. From Pearl Lake, the path becomes a wooden bridge that goes along Pearl Lake. After the lake, the path becomes wooden steps and wooden logs all the way to Chong Gu Monastery. After the monastery, the path is a wide, dirt road where Chinese tourists will be on horseback. The distance is about 3 3/4 kilometers (2 1/3 miles) and takes between 1 hour and 1 1/4 hours to complete. The elevation at Long Long Ba is 3770 meters.